College graduates take on many new responsibilities and obligations in the “real world” upon graduation, which offer many opportunities for change and growth in terms of career development and emotional wellness. Activities and choices made during this time can set the trajectory for the remainder of a college graduate’s adult life (“Committee on Improving the Health, Safety, and Well-Being of Young Adults,” 2015, p. 59). For many, this time period includes significant stress and anxiety as young adults feel the pressure of burgeoning careers, financial obligations, changes in support networks, and all the other adjustments that come with stepping away from college and into the workforce. Limited attention has been paid in the literature or at the practice level (i.e., colleges and employers) to the emotional wellness of college graduates as they transition from college to career. 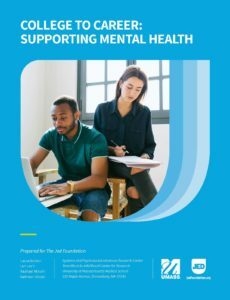 This report was undertaken to better understand the challenges to emotional wellbeing faced by young adults during the college-to-career transition.